I started trading my new strategy some time ago and my options ladder is already fully developed (meaning that now I have expiration every week and widening my spreads). If you’ve just subscribed to my newsletter, considering mirroring this strategy, and start trading it, this post is meant to help you as the newsletter may differ from what you can afford to trade. This post will be about money and trade management to allow you jumping in our moving money making train or even jump ahead of us. In this post I will show you how to find out how wide spread you can trade and how to adjust the trade idea from our newsletter. This is quite easy. Take the total amount you can or you want to trade, divide it by seven, then divide the result by 100 to find out how wide spread you can trade. For example, you have $5,000 available to trade. Divide 5000 by 7. The result is 714.28. Divide it by 100 and the result is 7.14. That means that you can trade 7 dollar wide spread. But SPX doesn’t have such width. SPX trades in 5 dollar increments. So the nearest available spread is 5 dollar wide spreads. If you have $30,000 available, you proceed the same way. Divide 30,000 by 7 = 4285 then continue dividing by 100 = 42 dollar wide spread. The nearest available will be $40 wide spread you can afford to trade. As of this writing we are trading 10 dollar wide spreads going towards 15 dollar spreads. Our goal is to widen the spreads to 40 dollars, then we will start adding contracts. If, for example, we put our 10 dollar wide spread, but you can afford 40 dollar spread, the diagram below show how to proceed. Now you know how adjust your trade both directions – narrowing the strikes or widening them. Now that you know how much you can trade and how to adjust the strikes, start building up the ladder. What does it mean? The ladder’s purpose is to create expiration every week. We want weekly income. We want trading weekly, but we want as high probability of profit (POP) as possible. In the past I used to trade weekly options against SPX with 4 to 7 DTE (days to expiration). The risk was high and never I was sure how the trade ends up. Trading 45 DTE increased my probability of profit to 80% – 92%. Every Monday evening you will receive a newsletter with our trade idea. Start selling one Iron Condor per week. Do not invest all money at the same time. Use only one trade. Every week you will be opening a new trade and at seventh week you will be opening a trade #7 while on Friday, your trade #1 will be expiring. From then you will have expiration every week. Your trading will now simulate weekly trading. You will have weekly income money making machine on and running. Let’s say you have been trading for some time and cash is piling up in your account. It is a good opportunity to start widening your spreads. This takes some ahead planning. You do not want to widen your spread in one week and then have no money the next week to open a new trade. Here is a procedure how to determine if you can widen a spread or not yet. Look at your money available to trade for options (options buying power). Let’s assume we are trading 10 dollar wide spreads and thinking to widen them to 15 dollar. To find out check to following. For example, your latest options BP (buying power) shows $773 and you will have a Friday expiration the next day. On Saturday, your BP jumps to $2248. If we open 15 dollar wide spread next Tuesday, will we have money for the subsequent trades? Let’s do some math. This shows that if we open a new trade with 15 dollar wide wings, we will have enough money for the next week trade. Thus it is doable to widen your spreads. You can continue counting this every week to see whether you should stay with your current width or widen it. My goal is to reach 40 dollar wide Condor wings after which I plan on start adding contracts. This goal may change, I may later on adjust to 50 dollar or 100 dollar wide wings if it makes sense. I do not know where the cut off of feasibility is, but once I find out, I will let you know. If it won’t make sense to trade 50 dollar spread because of credit will be same as with 40 dollar spread but risk larger, then it will be better add contracts instead of widening the spreads. In this case, we will start opening new trades on Tuesday and Wednesday. We will open one contract on Tuesday and one new contract on Wednesday. So if you still have more money than us allowing you trading more contracts than us, you can go ahead and open more contracts. Per this math, you can trade five $40 wide spreads. This will allow you opening two contracts on Tuesday and one contract on Wednesday and one contract on Thursday. Still all trades will have 45 DTE on Friday, but now you will be trading every day (we will not trade on Mondays and Fridays). · Why avoiding Mondays and Fridays? I do not have this empirically verified and only go with what I read other traders commented on this. It is said that on Mondays and Fridays the value of options decays the fastest and on Fridays, there is very little to no extrinsic value in options, so you are literally leaving money on the table. As I said, I do not have my own experience on this, but I have seen many experienced traders advocating and opening new trades on Tuesdays or Wednesdays and sometimes on Thursdays. Because of that, I do the same, but do not ask me for a reason. Once I find out, I will let you know. The probability of a full loss is lower with wider spreads. Yes, it is cheaper to trade wider spread than narrow one with more contracts. Try it for yourself. If you open for example a 15 dollar wide spread and three 5 dollar spreads, you will pay commissions for 15 dollar spread for one contract. It could be let’s say $11.00. For three contracts of 5 dollar spread you will pay more, let’s say 21 dollars. The probability of loss is lower with wider spreads than narrower. This is the best and strongest argument for wider spreads. 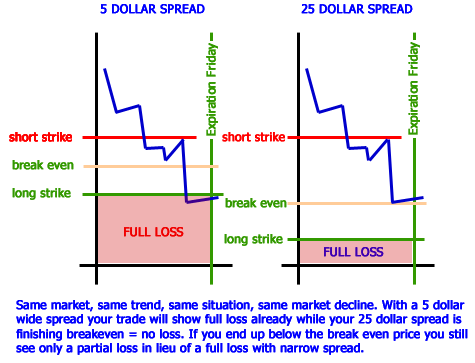 You need to understand how spreads work and when they bring the full loss. You will experience a full loss when the underlying price slices through both of your strikes. What is your probability of full loss then? As you can see from the picture above, wider spread is actually protecting you from a full loss. While your 5 dollar spread is already losing everything, your 25 dollar spread may still be above your breakeven price and thus no loss. If you also move your calls down (converting to Iron Clad), you can offset any potential loss from this trade whatsoever. The last benefit is that if you decide rolling the trade, it will be easier to roll the 25 dollar wide spread for a credit than the 5 dollar spread. In this post I tried to show you how you can start trading Iron Condors I provide in my newsletter when you start late or have different money available for trading. I presented you with money management, how many contracts to trade, how wide spreads and why. If you decide to give it a shot and trade, just follow the rules and be consistent. Do this every week and your account will grow fast and fat. And if you need to gain some experience first and see how the strategy works, then just paper trade it. Paper trade it as long as you see how it works, how the strategy makes money, loses money, and how you can defend it. Nevertheless, I give you a hand and help you if you want. But the decision is yours. What is the criteria or base to find the weekly spx strikes? Do you have pattern or technical indicator as it is consistent every week? Have you ever think of using iron butter fly like shorting same call and put stoke for credit? I only use TA to identify the trend, supports and resistances to make sure I trade with a trend. Then I sell 1SD strikes (about 0.15 delta). Then the next criteria is to collect min $25 premium on put spread on $30 on Iron Condor. So if the nearest expiration cannot provide that premium at 16 delta I go into the next one. I never traded Iron Butterfly on SPX as I think it is a trade to benefit with a sudden drop of implied volatility and today SPX volatility is low. So I only used Iron Fly on stocks and before earnings. If you want, you can follow our trades on our Facebook page here: https://www.facebook.com/zzcapital14/ or join our trading group here https://www.facebook.com/groups/putdividends/ to get our trading ideas. Hello is the news letter still available? 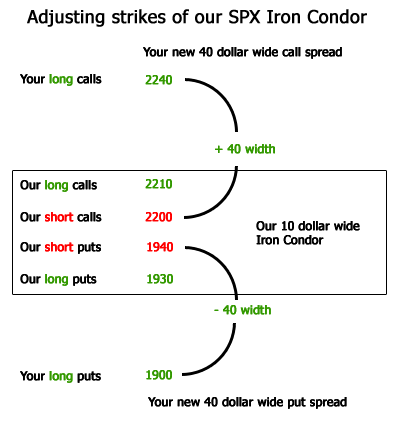 How do you determine your Short spread? What do you mean by “short spread”? Both spreads (call spread and put spread) are short. Nick, you can start with even smaller amount of money. You can contact your broker if they allow you trading options with smaller account or you need margin. I assume you do not need margin, and in that case you will be trading cash secured options. If the broker tells you that you need margin, then you will need to raise cash to $2,000. So, ask your broker if you can start trading (selling) options put and call spreads with only $1,500. If you start with $1,500, then you will be able to open only 3 contracts of 5 dollar wide spread and build the account up. So you open 3 trades in three consecutive weeks, then wait four more weeks for your first trade expiring, etc. and slowly you will be adding more and more to it. It will take longer but it will grow and it will speed up. You will be surprised. I guess I need to wait for the next newsletter. I used today’s closing price as the target and when I created the 4 contract spreads (1 put -27 strikes out, 1 put -26 strikes out, 1 call +26 out, 1 call +27 out)it added up to around $2000. What target did you use on Tuesday? I am not sure I understand your question. What do you meant by “target”? I also do not understand you quote of “1 cal +26 out”. What do you mean by that? Ok, I think i didnt understand how it really worked. I see now that you buy a put and sell a put, buy a call and sell a call. When you do this are they naked calls and puts or covered calls and puts? Nick, no they are not. They would be naked, if you just sold puts and sold calls. But because you are buying a protective put and protective call (creating a spread) you are not “naked” and your risk is capped by the width of the spread. So for example, if you sell 1950 put and buy a protective 1945 put, you risk is the difference between the two or 5 dollars. But because options represent 100 shares, that number needs to be multiplied by 100 – so your risk will be $500. If you have a few millions in you account, you would be able to trade SPX puts naked, but you would need 1950 * 100 or 195,000 to start with one naked contract (with margin you would nee approx. $41,000 of that amount). Se we do not have it, we have to go with spreads which are a lot cheaper. Very clearly articulated strategy. I still am struggling to get it all together to implement it. I dont think anything could have simplified it better than this article. Deepee, thank you. I am trying to help others to achieve same financial independence as I am hopefully going to achieve too.